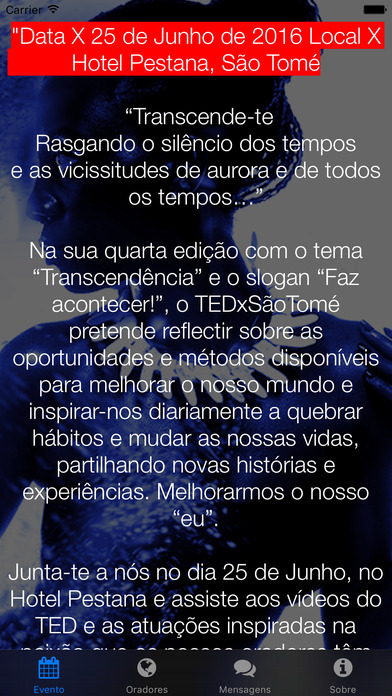 TEDxSãoTomé for the iPhone is a companion app for the TEDxSãoTomé conference held in São Tomé e Principe on June 25th, 2016. In its fourth edition under the theme "Transcendence" is intended to reflect on the opportunities and methods available to improve our world and inspire us daily to break habits and change our lives, sharing new stories and experiences. Improving our "I". Join us on June 25 at the Pestana Hotel and watch the videos of TED and performances inspired by the passion that our speakers have for what they do. TEDxSãoTomé aims to be a platform for raising the visibility of ideas with local impact and create a network that empowers entrepreneurs and change agents to make their projects happen. 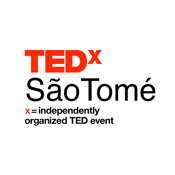 TEDxSãoTomé takes the name of the capital where it will be held – São Tomé, symbolizing the centrality, the sense of extended sharing and the need to "think global and act locally".